Domaine de Fontavin Chateauneuf du Pape is new producer in Chateaneuf du Pape as the estate only started to produce, bottle and sell their wine in 1989. But the Chouvet family has a long history in the Southern Rhone Valley as wine growers. Helene Chouvet, who manages Domaine de Fontavin today is the 7th generation of vine growers to continue the family tradition. 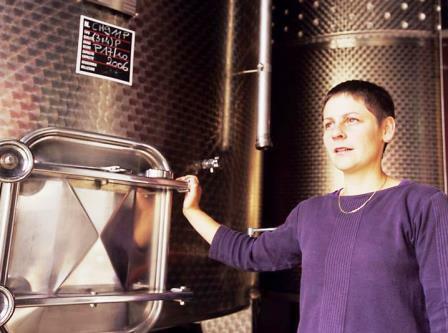 Helene Chouvet began working full time at Domaine de Fontavin in 1996. She was followed by Agathe Lauziere, who started at the property full time in 2001. In 2008, Domaine de Fontavin moved to 100% organic farming techniques for all their vineyards. Domaine de Fontavin owns 9 hectares of vines in Chateauneuf du Pape. 8.6 hectares are used for growing the red grape varietals. .4 hectares are used for the production of white Chateauneuf du Pape wine. Domaine de Fontavin uses 100% organic farming techniques in all their vineyards. They were certified as Agricuture Biologiqe in 2011. Domaine de Fontavin has old Grenache vines, the oldest of which date back more than 75 years. Domaine de Fontavin produces 3 red Chateauneuf du Pape wines and 1 Chateauneuf du Pape Blanc. Domaine de Fontavin Chateauneuf du Pape is produced from a blend of 85% Grenache and 15% Syrah. The vines are on average 40 years of age. The wine is aged for up to 18 months in a combination used, French oak barrels and demi-muids. The production is 2,500 cases per vintage. Domaine de Fontavin David and Goliat made its debut in 1995. The wine is made from almost 100% old vine Grenache. Up to 5% Syrah can be included, depending on the vintage. The fruit comes from their oldest vines that are more than 75 years of age. The vines are planted in the rock strewn terroir found in the Les Saumades vineyard. The wine is aged in a combination of demi-muids and French oak barrels for 12 months. The production is slightly less than 1,300 cases per year. Domaine de Fontavin Terre d’Ancetres is made from a blend of 70% Grenache, 20% Syrah and 10% Mourvedre. The vines are planted in the Le Gres, Saintes Vierges and Les Sauvines lieu-dits, where you find a terroir of mostly rocks and stones with some sand clay. The wine is aged in tank. Domaine de Fontavin Chateauneuf du Pape Blanc is made from a blend of 70% Grenache Blanc and 30% Roussanne. The wine is aged in a combination of new and used French oak barrels for 6 months. Domaine de Fontavin can be enjoyed on the young side. Young vintages can be popped and poured, or decanted for about 1 hour, give or take. This allows the wine to soften and open its perfume. Older vintages might need very little decanting, just enough to remove the sediment. Domaine de Fontavin is usually better with 3-4 years of bottle age. Of course that can vary slightly, depending on the vintage. In the best vintages the wine should be consumed within 5-12 years after the vintage. Domaine de Fontavin is best served at 15.5 degrees Celsius, 60 degrees Fahrenheit. The cool, almost cellar temperature gives the wine more freshness and lift. Domaine de Fontavin is best served with all types of classic meat dishes, veal, pork, beef, lamb, duck, game, roast chicken, roasted, braised, stewed dishes, sausage, barbecue and cassoulet. Domaine de Fontavin is also good with Asian dishes, hearty fish courses like tuna, mushrooms pasta, eggplant, cheese and tomatoes. The white wine of Domaine de Fontavin is best served with a myriad of different seafood dishes, shellfish, crab, lobster, sushi, sashimi, chicken, pork and veal, as well as Asian cuisine. Domaine de Fontavin also produces red, white and rose’ wine in the Gigondas, Vacqueyras and Cotes du Rhone appellations from 31 hectares of vines they own. The vineyards are divided as follows; 16 hectares in the Cotes du Rhone, 6 hectares in Gigondas, 4 hectares in Vacqueyras and 3 hectares in the Muscat de Beaumes de Venise as well as one hectare of unclassified vines. Round, forward, juicy and lush, this modern styled wine pops with espresso, smoke, black cherries and spice. Lush and polished, ripe and sweet, this concentrated and complex wine can age, as well as show great in its youth, due to its round, fruit filled, open character. The wine is produced from 95% old vine Grenache and 5% Syrah and is aged in mostly, new oak barrels. Floral, soft and polished, with silky, polished tannins, freshness and just enough spicy, peppery, black raspberry in the finish to satisfy. The wine was produced blending 80% Grenachre, 15% Syrah and 5% Mourvedre. Spicy red fruits, silky and fresh, with a real depth of flavor that starts and stays with you. The finish has a hint of dark cocoa in the end too, that is a nice touch as ti compliments the sweet, red berries. The wine was produced from blending 70% Grenache, 20% Syrah and 10% Mourvedre. Lusty and luscious fruits, with sweetness in the kirsch at its core, there is lots of kirsch and more sweet fruit in the finish. The wine is produced from 95% old vine Grenache and 5% Syrah. Medium bodied, refined, soft, forward and fresh, I liked the juicy, blast of ripe kirsch that sticks with you. Medium bodied, soft, polished, forward, early drinking wine with a tasty, black raspberry and peppery core of fruits. There is a blast of oak in the nose that is made better by the lusty, plush, supple fruits on the palate that was produced from a blend of 95% Grenache and 5% Syrah. Medium bodied, spicy red fruits and good freshness are found in this forward styled wine that was produced from a blend of 85% Grenache and 15% Syrah. 95% Grenache and 5% Syrah produced a medium bodied, silky wine with sweet, black cherries and a hint of jam. The wine is fresh and forward in style and reached 15% alcohol. Elegant and soft, this medium bodied, lighter styled, red berry filled wine display’s some dryness in the finish. Incense, licorice and jammy berries, full bodied, fresh, and balanced, but perhaps a bit too much oak in this modern adaption of Chateauneuf du Pape which leaves it feeling a little bit dry in the finish. If it comes together with time, it will be a better wine, deserving a higher score. Silky, polished, forward, medium bodied and just delicious today, the wine is all about the sweet, ripe, kirsch, black raspberry and peppery notes. It is not a wine to lay down, it's going to be best over the next few years.